This initiative is made possible through a collaborative relationship between the NCCDD and North Carolina Money Follows the Person Project (NC MFP), a Medicaid project that assists Medicaid-eligible North Carolinians who live in inpatient facilities to move into their own homes and communities with supports. Launching this initiative in partnership with the NC Money Follows the Person program (NC MFP) is a natural step for the Council, since it follows an earlier initiative entitled Seeing is Believing (SIB). From 2008 to 2010, the NCCDD sponsored the Seeing is Believing initiative. This initiative facilitated a learning collaborative of interested I/DD providers to examine how to better facilitate the practice of individuals with I/DD to live in their own homes. Click here to view the final report for the Seeing is Believing Initiative. Many individuals with intellectual and other developmental disabilities (I/DD) in North Carolina have not had access to one of the most person-centered service options available: receiving supports needed in one’s own home. Services provided to people with I/DD are increasingly shifting to smaller scale settings, including group homes, host families or private homes but still do not provide person-centered, individualized supports. While smaller, congregate settings offer physical integration into the communities, they rarely provide the opportunity for true, inclusive community integration. 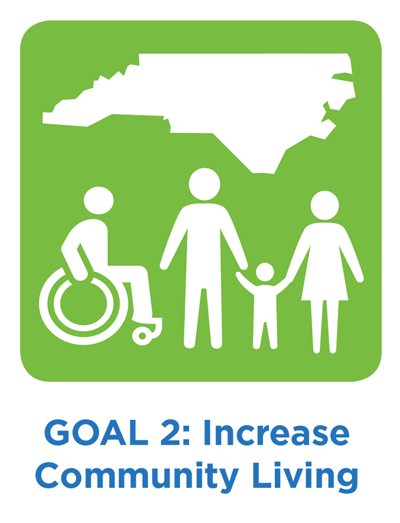 Expand and strengthen North Carolina’s capacity to support people with I/DD to participate in supported living. Launch a stakeholder group known as the Learning Community to support individuals with I/DD and their families, MCO and state staff to build a clarified understanding of supported living concepts and improve their capacity to support individuals to utilize the service. Provide technical assistance to providers and direct support staff on practices that facilitate supported living. Launched a statewide kickoff event to promote the supported living waiver service and provide opportunities for stakeholders to become engaged in the work that will shape the future direction of the service. Partnered with 4 pilot demonstrations agencies to serve up to 24 individuals in models to learn and evaluate the supported living service. Provided opportunities to participate in webinars and workshops to expand the understanding of the supported living service, including meetings focused on better supporting individuals with the highest level of support needs. Developed a supported living guidebook to understand, transition to and evaluate supported living services. Information about the initiative was shared in the Mountain Xpress on March 15, 2017 reaching an estimated audience of 25,000 readers. Hosted kick-off conference, “Supported Living: A Shared Vision” in Greensboro on March 28 & 29, 2017 attended by 282 people. Keynote presentation and breakout sessions offered to reinforce initiative at NC Training, Instruction, Development, and Education (TIDE) conference in Wilmington on April 24, 2017 and sessions in Asheville on October 24 and 25, 2017. Presentation to Vaya Provider Advisory Council I/DD Subcommittee on May 17, 2017 to advance initiative. Presentation at J. Iverson Riddle Developmental Center on May 19, 2017 to advance initiative. One person transitioned out of the center to her own apartment in October. Presentation to guardianship agency on June 13, 2017 to advance initiative. Linda Kendall Fields presented to Vaya Provider Advisory Council I/DD Subcommittee on June 21, 2017 to advance both the “Rethinking Guardianship: Building a Case for Less Restrictive Alternatives” and “Supported Living: Making the Difference” initiatives. Presentation at Provider Summit and Learning Academy on December 13, 2017 to advance initiatve. With Community Bridges Consulting Group, launched the on-line Learning Community with the “Supported Living 101” webinar on September 25, 2017 and the "Health vs. Safety and Risk vs. Liability" webinar on December 11, 2017. Hosted six Learning Community webinars in 2018: two facilitated by two of the four providers and two that focused on specific topics that impact transitions to supported living: the coordination of healthcare and the role of the direct support professional. Presented at the 2018 National Association of Councils on Developmental Disabilities (NACDD) Annual Conference in Maryland on July 11, 2018. Conducted a Beyond Behaviors workshop led by national expert David Pitonyak on July 31, 2018. 199 individuals participated. Hosted the first Stakeholders Virtual Meeting on October 2, 2018 to give family members and people with I/DD a way to inform the system without needing to travel for a face-to-face meeting. Scheduled two webinars to be facilitiated by providers in February and March 2019. Work continues on a Supported Living guidebook. 27 people have moved into their own homes, 11 from group living arrangements. 2 people are making plans to move into their own homes. All activities related to this Supported Living initiative will be that individuals interested in choosing the supported living option have organizational support to do so. This initiative will launch a learning community around the work of the supported living initiative. If you are interested in participating in the work of this initiative as a member of the Supported Living Learning community, please click here to fill out the form. November 2018 Webinar: Health, Person-Centered Living & Individualized Supports: What’s the Connection? March 2019 Webinar: Provider Experiences with Supported Living (Arc of NC) Access the pdf. February 2019 Webinar: Provider Experiences with Supported Living (Turning Point Services) Access the pdf. November 2018 Webinar: Health, Person-Centered Living & Individualized Supports: What’s The Connection? Click here to access the webinar. October 2018 Webinar: Supporting People with Informed Decision Making - Click here to access the webinar. Access the pdf. October 2018 Webinar: Supported Living Virtual Stakeholder Meeting - Click here to access the webinar. Access the pdf. April 2018 Webinar: Provider Experiences with Supported Living (Liberty Corner Enterprises) - Click here to access the webinar. Access the pdf. February 2018 Webinar: Personal Experiences with Supported Living (FIRST) - Click here to access the webinar. Access the pdf. December 2017 Webinar: Health vs. Safety & Risk vs. Liability - Click here to access the webinar. September 2017 Webinar: Supported Living 101 - Click here to access the webinar. Click here to download a pdf of this initiative. Click on each presentation title below to download a PDF copy.